SAN FRANCISCO, April 5, 2017 — Seaweed, the edible algae with a long history in some Asian cuisines, and which has also become part of the Western foodie culture, could turn out to be an essential ingredient in another trend: the development of more sustainable ways to power our devices. Researchers have made a seaweed-derived material to help boost the performance of superconductors, lithium-ion batteries and fuel cells. The team will present the work today at the 253rd National Meeting & Exposition of the American Chemical Society (ACS). ACS, the world’s largest scientific society, is holding the meeting here through Thursday. It features more than 14,000 presentations on a wide range of science topics. “Carbon-based materials are the most versatile materials used in the field of energy storage and conversion,” Dongjiang Yang, Ph.D., says. “We wanted to produce carbon-based materials via a really ‘green’ pathway. Given the renewability of seaweed, we chose seaweed extract as a precursor and template to synthesize hierarchical porous carbon materials.” He explains that the project opens a new way to use earth-abundant materials to develop future high-performance, multifunctional carbon nanomaterials for energy storage and catalysis on a large scale. Traditional carbon materials, such as graphite, have been essential to creating the current energy landscape. But to make the leap to the next generation of lithium-ion batteries and other storage devices, an even better material is needed, preferably one that can be sustainably sourced, Yang says. With these factors in mind, Yang, who is currently at Qingdao University (China), turned to the ocean. Seaweed is an abundant algae that grows easily in salt water. While Yang was at Griffith University in Australia, he worked with colleagues at Qingdao University and at Los Alamos National Laboratory in the U.S. to make porous carbon nanofibers from seaweed extract. 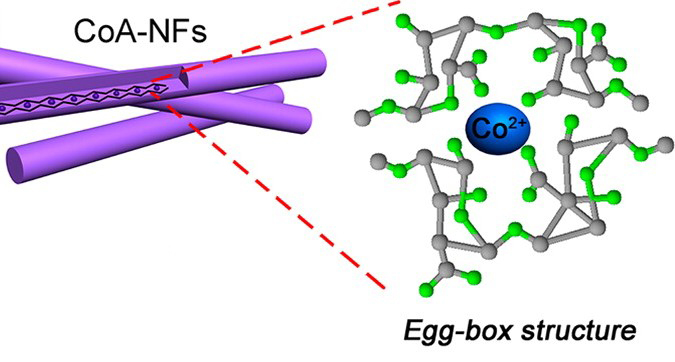 Chelating, or binding, metal ions such as cobalt to the alginate molecules resulted in nanofibers with an “egg-box” structure, with alginate units enveloping the metal ions. This architecture is key to the material’s stability and controllable synthesis, Yang says. Testing showed that the seaweed-derived material had a large reversible capacity of 625 milliampere hours per gram (mAhg-1), which is considerably more than the 372 mAhg-1 capacity of traditional graphite anodes for lithium-ion batteries. This could help double the range of electric cars if the cathode material is of equal quality. The egg-box fibers also performed as well as commercial platinum-based catalysts used in fuel-cell technologies and with much better long-term stability. They also showed high capacitance as a superconductor material at 197 Farads per gram, which could be applied in zinc-air batteries and supercapacitors. The researchers published their initial results in ACS Central Science in 2015 and have since developed the materials further. For example, building on the same egg-box structure, the researchers say they have suppressed defects in seaweed-based, lithium-ion battery cathodes that can block the movement of lithium ions and hinder battery performance. And recently, they have developed an approach using red algae-derived carrageenan and iron to make a porous sulfur-doped carbon aerogel with an ultra-high surface area. The structure could be a good candidate to use in lithium-sulfur batteries and supercapacitors. More work is needed to commercialize the seaweed-based materials, however. Yang says currently more than 20,000 tons of alginate precursor can be extracted from seaweed per year for industrial use. But much more will be required to scale up production. The researchers received funding support from the National Natural Science Foundation of China, the National High-Tech Research and Development Program of China and the Australian Research Council Discovery Project. Scientists have created porous “egg-box” structured nanofibers using seaweed extract.